The national park stretches over Lozere, Gard and ARdeche and two regions of France; the Languedoc-Roussillion and Rhone Alpes. The main centre for information on visiting the park is located at Florac and is probably the best place to start exploring. Best explored by hiking or biking, the park can still be travelled by car and offers spectacular views and wild countryside. 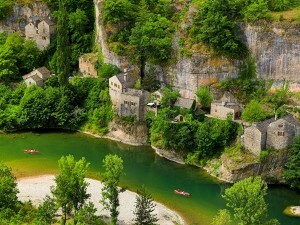 The Gorges du Tarn is a major attraction and offer the deepest, most spectacular gorges anywhere in Europe. Canoeing is a popular way of exploring the gorges! A scenic road follows the gorge with plenty of stopping places to admire the view. The gorges begin at the north eastern end with the old stone bridge at Quezac and continue to the south western end with Les Vignes. Everything in between is breathtakingly beautiful. Another scenic highlight are the dolomitic limestone rock formations at Chaos de Nimes le Vieux (from Florac towards Meyrueis, via the Col du Perjuret). One of the best known routes n the park is that which was followed by Robert Louis Stevenson in his ‘Travels with a donkey’. A marked trail can be followed and you can even hire a donkey to go along with you! Whilst walking in the Cevennes, you may well come across protestant temples or anduze or catholic churches which are the remains of the religious wars of the 17th century. You may also discover the silk worm breeding houses known as magnagneries which represented the wealth of the Cevennes in the 19th century. Many picturesque hamlets with typical Cevenol architecture are dotted abou the park such as the fortified village of La Garde-Guerin, Le Pont de Montvert, Florac, St Laurent de Treves (with dinosaur footprints engraved in the limestone) and the Meyrueis and Roqueldols castle. Along the mountain ridges, you may find menhirs and dolmen; ancient burial places that witnessed the passing of ancient peoples . The oldest constructions date to Neolithic times and some artifacts such as pots and tools, date as far back as 4,000BC. The Celts occupied large parts of the Cevennes before the Romans, who built the major roads you are likely to be travelling on. You could even swim the refreshing and clear waters of the Gardon and explore the natural beauty in the way the ancient peoples did so many years ago!